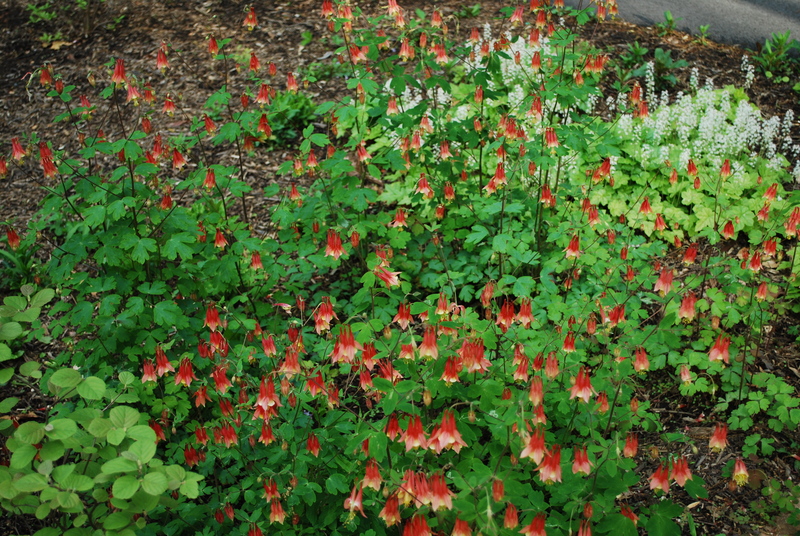 A Garden For the Trees……… Part II: Jenkins Arboretum « John Bartram Lives! – Thomas Jefferson, Memorandum of Services to My Country, after 2 September 1800. 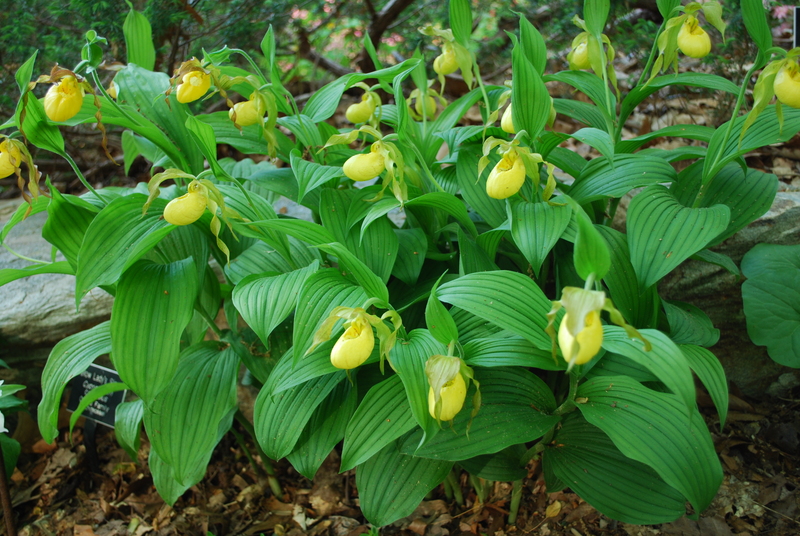 Cypripedium spp. (Lady-Slipper Orchid) is our native North American species. It can be found throughout the northeast on the floor of the forest. I have added more than 200 plants to the international horticultural inventory. Although it is wrong for me to state it, I am proud of this accomplishment. That sense of pride has certainly come at great cost with little chance of repayment. I have spent months of my life in inconvenient travel through miles of forest trails climbing countless trees and mountains in search of unique and wondrous new species. My pride is one of the seven deadly sins. But I consider this transgression less than many that my fellow men easily commit without thinking. The sun sets on a small leaf laurel. One of the my personal favorites. 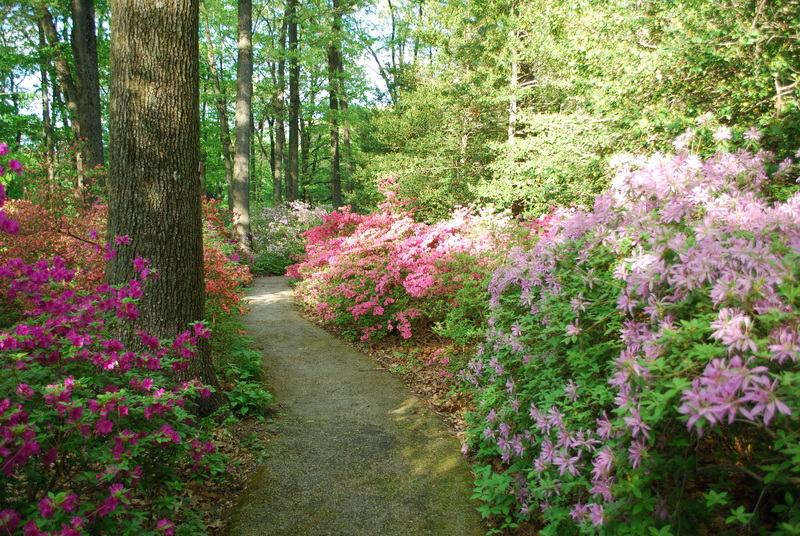 Although it has a number of magnificent specimens of many trees of my introduction, Jenkins has a large collection of small-leaved laurels and other relatives of the family that has come to be called Rhododendrons. 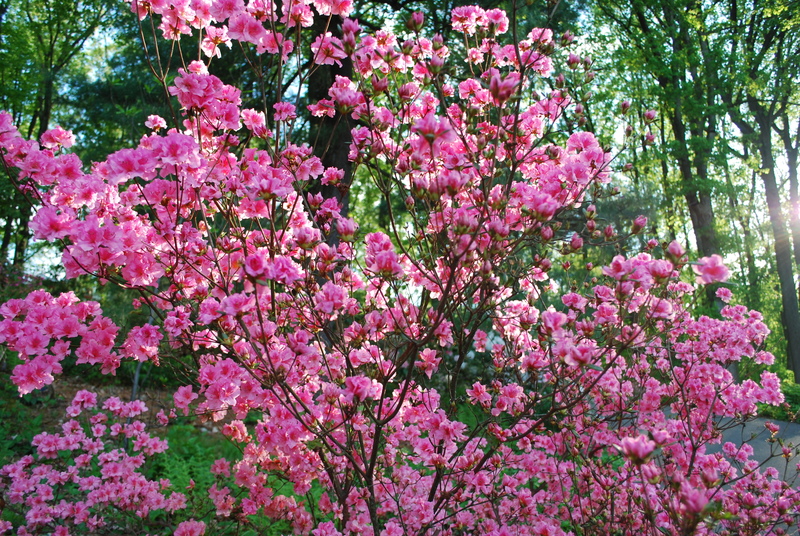 Jenkins has plants of the genus Kalmia. And let me say that Peter Kalm, then and since, was a common thief and user. He took food at my table! He was sent to my garden by Carl Linnaeus to plunder my treasures, steal my secrets, and accept all of the “free” plants he could stuff into his valise. He spent three years in North America “discovering” its many horticultural wonders. He returned in triumph as the founder of dozens of unrecognized and unknown species. Carl named Kalmia after HIM. Not me! It was an astounding rebuke to all of my hard-won knowledge and hard-earned collection of unique plants. Peter Kalm’s collecting triumphs came mostly by digging them out of my front yard! Just imagine the supreme audacity of the man! When I think of how I treated him as a second son, the wrath builds up within me. I am at such odds with this person who stooped so low as to willfully accept my hospitality while at the same instant was considering how many of my other children he would steal from under my nose. There was a time when the wrath of God would not have been equal to my fury. Wrath. It is but another deadly sin! So, I fought against it and overcame it. And through discussion and prayer with my wife, Anne, the feelings gradually faded. I am whole again. On a quieter note, Jenkins Arboretum has a dusting of spring ephemerals sparkling on the floor of the forest in April and May: Mertensia virginica , Tiarella, Trillium, Aquilegia canadensis. Everywhere one looks there is a reminder that spring blooms eternally. Spring is a celebration of rebirth and abundance. Glorious. The term ephemeral carries with it a meaning that may be a self-fulfilling prophecy. In man’s haste to clear and root and build and expand, these spring ephemeral plants are threatened with extinction. Because they disappear during the heat of summer, they many times escape our memory. In my travels, I always remember where they’ve been. But many times, once I’ve noted them and wished to collect their seeds in the following season, I’ve returned to find the colony gone without a trace. They can disappear at our passing. The Cypripedium or Lady-Slipper Orchid is one more of these delightful spring ephermerals. It is a true native of North America. You might remember that within every box of plants that I shipped overseas, I included a root of our native Lady Slipper Orchid. It was a trademark. And a challenge. I dared the English aristocracy to make such a spring as ours that would allow them to bloom. It took years and the creation of an industry of glass-house manufacture until Peter Collinson was able to duplicate the perfect combination of nature’s cycle. 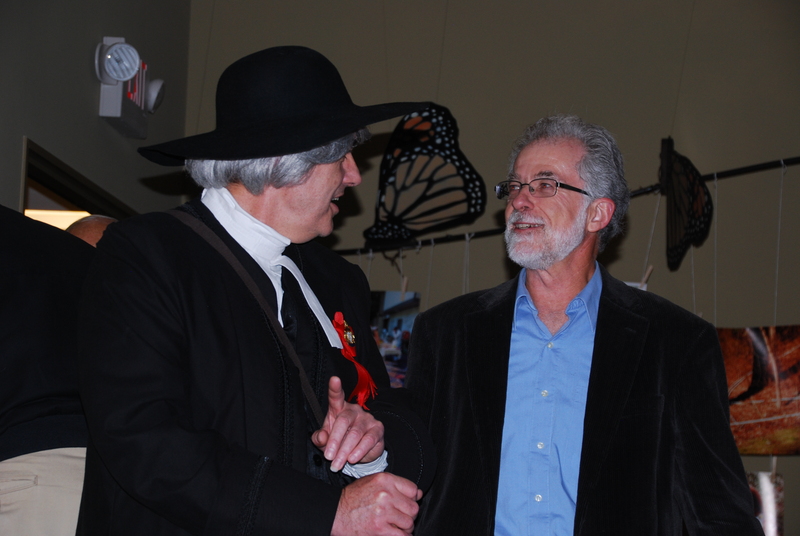 Mr. Harold Sweetman chats with John Bartram prior to his appearance at the lecture. Mr. Harold Sweetman, the director of Jenkins Arboretum, has put a clump of these fine Lady’s Slippers at the intersection of the main trail with the lesser path to his front door. He lives within his domain. His is a perfectly sustainable life. How I envy his existence. Envy! That is the third of the deadly sins that I have admitted since the start of this observation. And with that I should end to tempt God’s forbearance no longer. I beg your forgiveness. Yes, thats exactly what I wanted to hear! Fantastic stuff here. The data and the detail were just best. I believe that your perspective is deep, its just nicely thought out and actually fantastic to see a person who knows the best way to put these thoughts down so well. Wonderful job on this.